one happy little crafter: Ted the Chef! Hello there, thank you so much for visiting me today.....hope the week has got off to a decent start. Last weekend had been spent tidying up and Tilly-proofing my Mum's back garden, which has involved creating a gravel border and patio area, On Sunday morning a leg of the plastic garden chair that Alistair was sat on, just completely gave way and he was left in a heap on the floor with a very sore arm, the upshot of this was that most of the heavy work - dragging around 30 bags of Cotswold stone - had to be done by myself and the kids.....several days later I am still aching in bits I didn't even know I had and am definately feeling old! 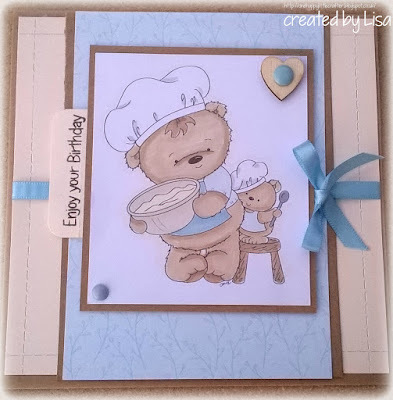 A fabulous card Lisa, such a cute image and lovely colour choices. I hope you have stopped aching now. Lovely sweet card. Thank you for joining us for our “Animals Acting Like Humans" challenge at Di’s Digi Designs. Hope to see you again.